D’Artagnan is the protagonist of the novels “The Three Musketeers” by Alexandre Dumas père. The character is initially a hotheaded poor young nobleman from Gascony wanting to joint the Musketeers in Paris. There he quickly becomes friends with the three musketeers Athos, Porthos and Aramis and has a series of adventures which put him at odds with Cardinal Richelieu. In the end, Richelieu, then First Minister of France, is impressed by d’Artagnan, and makes him a Lieutenant of the Musketeers. This begins his long career of military service, as detailed in the sequels to Dumas’ famous novel. 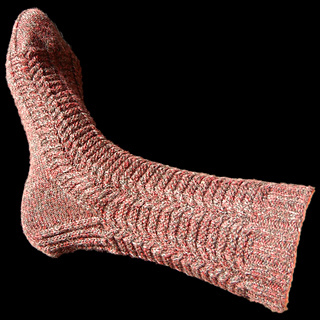 The lines of cables above a textured background in the pattern of these socks fit D’Artagnan’s character perfectly: always straightforward even when faced with a rough patch in life. 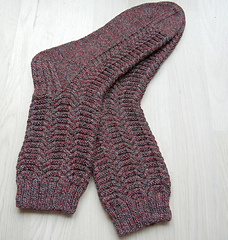 and just interesting enough to save the knitter from being bored to tears while making them.